A gift to the Claire Trevor School of the Arts provides tremendous benefit to the entire campus and community. We are the curators of creativity providing the campus with the resources and knowledge needed for imaginative and creative thinking that ignites new discoveries and reveals new solutions to the greatest challenges facing our world today. Art is UCI’s greatest asset for a brilliant future. Our students engage in professional level opportunities to perform and exhibit their work to the community at large. But our work goes beyond entertainment, serving as an agent of social engagement and a catalyst for social change by raising awareness and engaging a broad audience on a wide range of topics from social justice movements, to environmental concerns, and even the new technological frontier. In addition to engaging audiences and artists, we are committed to serving our local K-12 students, especially from underserved schools. The Claire Trevor School of the Arts hosts student groups for campus tours and hands-on learning opportunities throughout the year. Our arts students also travel to schools to provide curriculum-based arts projects. And during the summer months, our studios, stages, and laboratories are bustling with school children experiencing life as an undergraduate arts major as part of the Summer Academies in the Arts. The Claire Trevor School of the Arts depends on the community to be our advocates and investors. As state and federal support for UCI and the arts declines this becomes increasingly paramount. Generous gifts, of any size, support every aspect of our work from student scholarships, to research fellowships, to production costs, to facility renovations, community outreach, and more. We accept gifts of cash, company matching funds, securities, gifts-in-kind, annuities, remainder trusts, and bequests. To make a secure gift online click here. Our vision is bold and requires the support of inspired individuals, like you. Thank you for considering joining us on this exciting journey. Together, we will ignite UCI, the community, and the world through the power of the arts. We look forward to partnering with you as you consider investing in the future of arts. Please contact Jana A. Cain, Director of Development, to discuss your philanthropic goals and find out more about how you can bring them to life at the Claire Trevor School of the Arts. Why should I give to UCI Claire Trevor School of the Arts? I'm not comfortable giving online. Is it really safe? Because UC Irvine only receives a fraction of its total annual budget from state funding—just 11% —philanthropic contributions are critical to the university’s continued success. 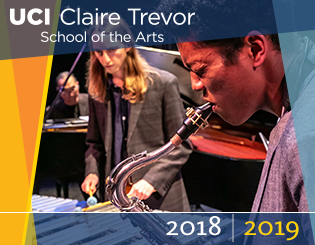 The Claire Trevor School of the Arts depends on private support so that it can continue to deliver the local impact, national influence and global reach it has achieved as the region’s leading arts program at a top-ranked research university. The UC Irvine Foundation uses industry-standard SSL (Secure Sockets Layer) encryption to protect the confidentiality of your personal information. Print this gift form and mail documents to the Claire Trevor School of the Arts along with your check or money order. You will need to provide your personal information so that you can be credited for the gift. However, if you want your gift to be acknowledged as anonymous, please note this in the “Comments” section. To let us know of changes in address, marital status, etc., please send an e-mail to artsinfo@uci.edu. Please call 949-824-8750 or email us at artsinfo@uci.edu and we’ll be happy to answer your questions.